Disclaimer: I received a gift card to help promote this amazing deal for the holidays from Massage Envy DFW. That’s why we get you something that you are forced to enjoy like manicures, clothes and massages, you can’t feel guilty about just appreciating a gift, right? It would rude to waste it. Now take a look at that Christmas list and see who could benefit from one hour of stress-free attention to work out those knots…I know everyone on my list would (and it’s a BIG list!) Then get the best reward by scoring a massage for yourself by just giving to others! The Dallas-Fort Worth Massage Envy Spas have a special holiday offer starting today: buy three gift cards (or any combination that equals $225) and receive a free, one-hour massage session. This offer is only valid for purchase at the 33 DFW Massage Envy Spas, but can be redeemed nationwide at 900 locations. 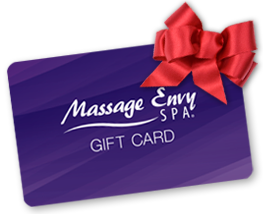 Massage Envy Spa gift cards may be used for any combination of products and services offered in any Massage Envy Spa nation-wide. Fourteen DFW Massage Envy Spas offer Murad® healthy skin facials. You’ve until December 24 to get your list checked off with this offer! Definitely going to see that Santa knows I need this! Oh this mama could use a massage too! I hope Santa sees this at the top of my list! Oh, I did this last year and am totally envious that I’m not the one doing it this year. ENJOY! !